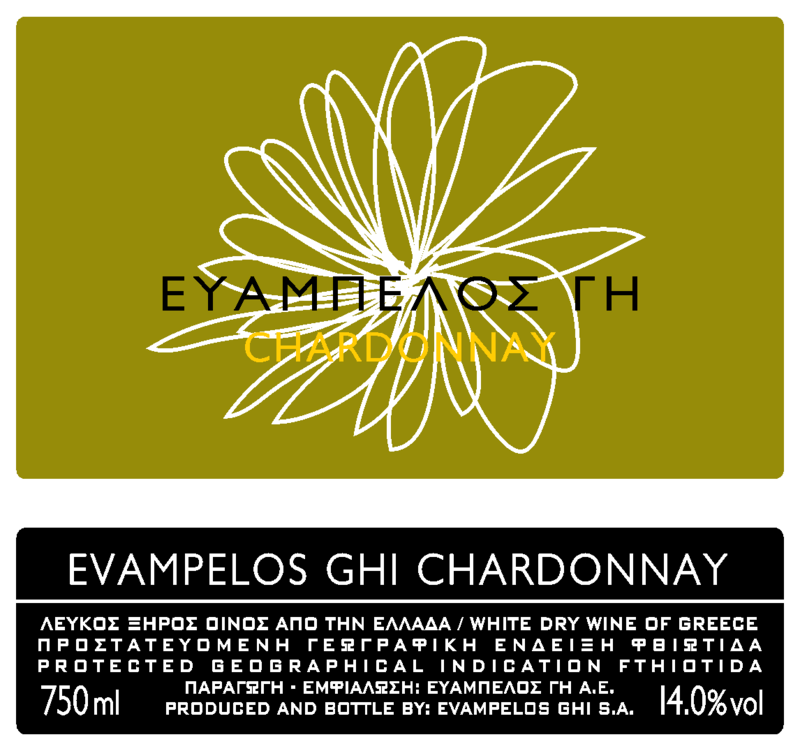 The word Evampelos Ghi in Greek is used in order to characterize a beautiful and prosperous vineyard, a name that in our case wasn’t selected euphemistically, the soil composition is sandy-clay, rich in organic substances with a significant percentage of gravels- that results in a very good drainage during the early rainfalls of August and September- assuring in this way the excellent maturation, the rich organoleptic features and the expressiveness of the wine. In large part of the soil, calcium can be found in a depth of over 60 cm. The calcium adds to the grape minerality and pulse. A very important climatic feature of the area is the beneficial rainfalls during the winter and the spring, while the warm summer with the dry and cool nights result in temperature variations up to 15°C. As a result the plants work feverishly, the sap circulates through the plant ensuring that way the rich fragrance, the phenolic maturity and the intense flavour of the wine. In this natural environment with the character and qualities described above the human intervention came into support, gentle but persistent, with care, love and knowledge in order to add and enhance the vigor of the natural environment. All the above reasons have made a lot of people to talk about a National Terroir that is really rare to find in areas out of the Gerakli slopes. Four Friends, restless scientists and creative professionals, bonded not only by the place they grew up but by their vision and love for the good wine, they combined their skills and their goals in order to create a collection of great wines that will promote their region and their love for wines. So in 2000 the Evampelos Ghi Estate was founded. The Estate’s name was not selected randomly, in Greek means the prosperous vineyard and it was used as tribute to the exceptional microclimate of the Gerakli plateau where the vineyard is situated. 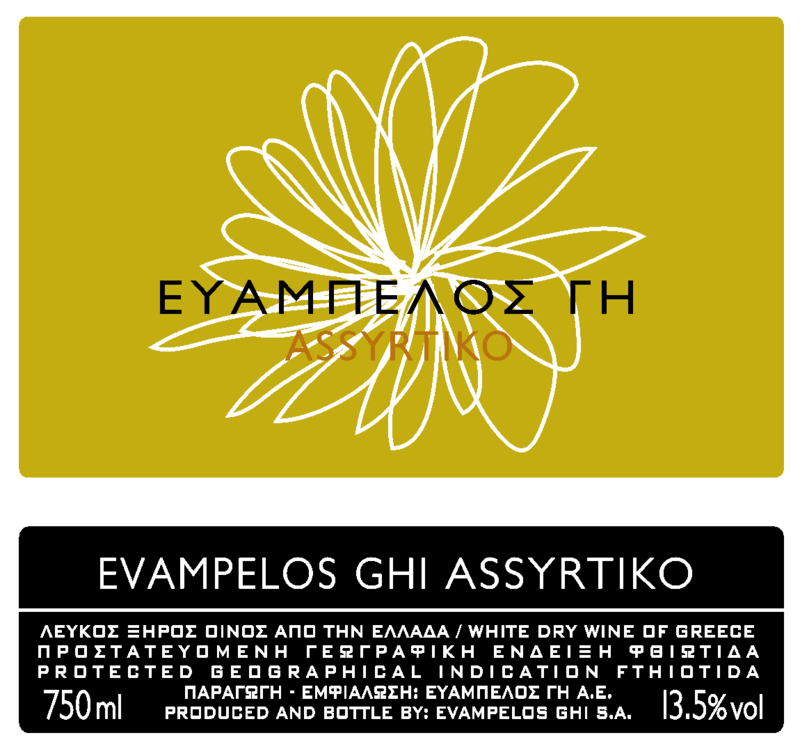 EYAMPELOS GHI - DOMOKOS WINES S.A. REGION: Gerakli, Domokos, Fthiotis, Central Greece. VINEYARD: Private Vineyard of 220 hectares at the Gerakli Slopes in 400m altitude with 8% inclination and northwest orientation. THE SOIL: The soil composition is sandy-clay, rich in organic substances with a significant percentage of gravels- that results in a very good drainage. ENVIROMENTAL CONDITIONS: A very important climatic feature of the area is the beneficial rainfalls during the winter and the spring, while the warm summer with the dry and cool nights result in temperature variations up to 15°C. As a result the plants work feverishly, the sap circulates through the plant ensuring that way the rich fragrance, the phenolic maturity and the intense flavour of the wine. 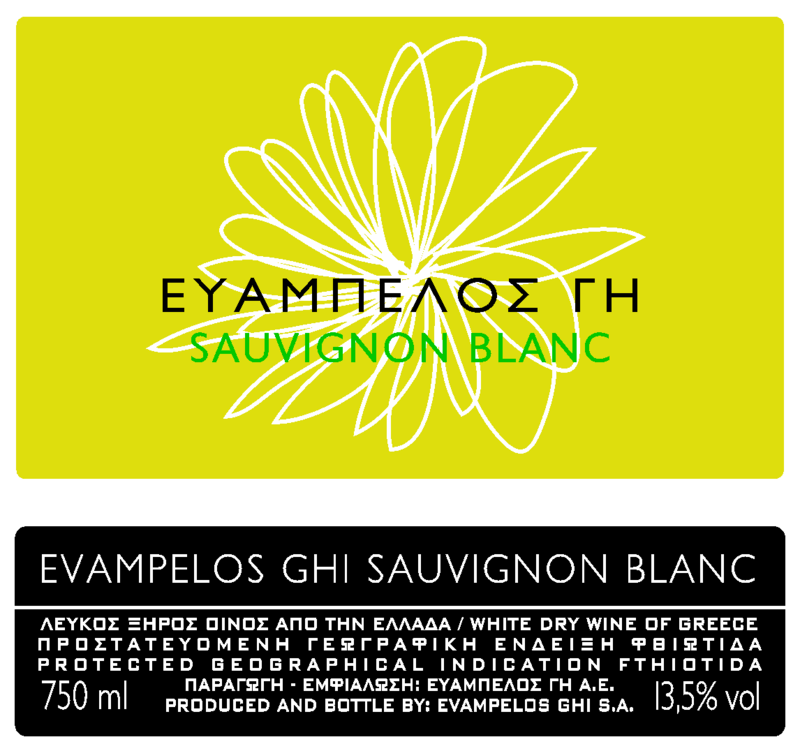 USED VARIETIES: 60% Assyrtiko, 20% Sauvignon Blanc and 20% Chardonnay. THE SOIL: The soil composition is sandy-clay, rich in organic substances with a significant percentage of gravels that results in a very good drainage. VINIFICATION PROCESS: Pre-fermentation infusion (Skin contact) at the10-12 °C (for about 6 hours), very low pressure of the must (juice, skins and seeds) at the press, juice refrigeration (12-15°C) for about 12 hours and mud extraction of the juice. Follows the alcoholic fermentation in oak barrels. MATURATION: 3 to 6 months in French and American oak barrels. 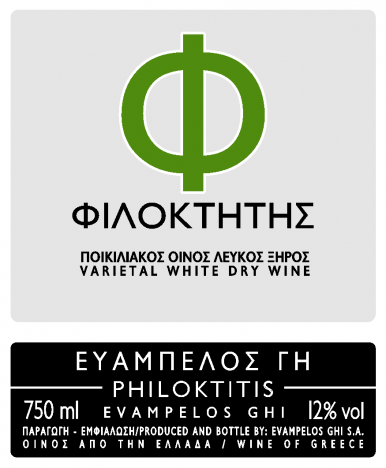 WINE CATEGORY: Protected Geographical Indication – Fthiotida, White Dry Wine. THE SOIL: The soil composition is sandy-clay, rich in organic substances with a significant percentage of gravels (about 20%)- that results in a very good drainage. VINIFICATION PROCESS: destemming, pre -fermentation infusion at 10-12°C (48 hours), alcoholic fermentation in anoxidizable tanks under controlled conditions and long post-fermentation infusions. USED VARIETIES: Cabernet Franc 60%, Merlot 40%. MATURATION: 18 months in French and American oak barrels and 6 months in the bottle. FEATURES: Deep purple color with a rich aromatic palette of red Fruits, Cherries and strawberries Its phenolic potential and the long lasting ageing process of the wine in barrels result in a purple character with sweet long aftertaste. Potential long lasting ageing in bottle for 10-12 years. 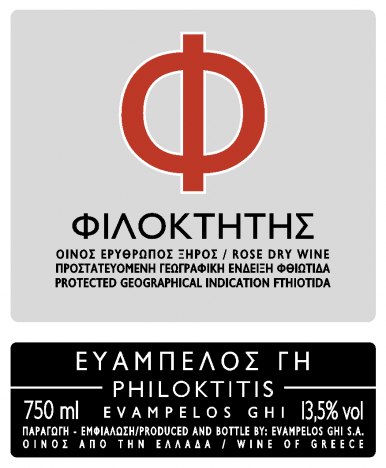 WINE CATEGORY: Protected Geographical Indication – Fthiotida, Red Dry Wine. THE SOIL: The soil composition is sandy-clay, rich in organic substances with a significant percentage of gravels (about 35%)- that results in a very good drainage. GRAPES PER ACRE: 8000kg – 900kg/acre. USED VARIETIES: Cabernet Sauvignon 60%, Syrah 40%. FEATURES: Deep purple color with a rich aromatic palette of red forest fruits, violet, chocolate and spices. Its phenolic potential and the long lasting ageing process of the wine in barrels result in a purple character with sweet long aftertaste. Potential long lasting ageing in bottle for 10-12 years. VINIFICATION PROCESS: Pre-fermentation infusion (Skin contact) at the10-12 °C (for about 6 hours), very low pressure of the must (juice, skins and seeds) at the press, juice refrigeration (12-15°C) for about 12 hours and mud extraction from the must. Follows the alcoholic fermentation at controlled conditions in anoxidizable , refrigerated tanks. VINIFICATION PROCESS: Pre-fermentation infusion (Skin contact) at the10-12 °C (for about 8 hours), very low pressure of the must (juice, skins and seeds) at the press, juice refrigeration (12-15°C) for about 12 hours and mud extraction from the must. Follows the alcoholic fermentation at controlled conditions in anoxidizable , refrigerated tanks. FEATURES: Bright oyster-white color, a complex bouquet of exotic fruits and lemon blossom, oily finish and long length aftertaste. ΚΛΙΜΑΤΙΚΕΣ ΣΥΝΘΗΚΕΣ: Ο χειμώνας και η άνοιξη χαρακτηρίζονται από σημαντικές βροχοπτώσεις. Το καλοκαίρι είναι ζεστό, ξηρό με δροσερές νύχτες (διαφορά θερμοκρασίας μέχρι 15°C) επιτυγχάνοντας άριστη φαινολική ωριμότητα των σταφυλιών. VINIFICATION PROCESS: Destemming, pro- fermentation infusion at the 10-12°C (for about 48-72 hours),exsanguination. Follows the alcoholic fermentation at controlled conditions in anoxidizable , refrigerated tanks (17-19 °C). USED VARIETIES: 90% Grenache Rouge and 10% Syrah or Merlot depending on circumstances. FEATURES: Pink rose color with violet glints. Compound aroma with notes of small red fruits (cherry,blackberry, strawberry)and a sweet fragrance of butter candy. Rich and oily finish, with rectilinear acidity that add length. Crispy tannins with soft and fruity aftertaste. REGION: Gerakli, Domokos, Fthiotis, Central Greece & Kallithea, Farsala, Thessaly. VINEYARD: Private Vineyard of 220 hectares at the Gerakli Slopes in 400m altitude with 8% inclination and northwest orientation. Private vineyard of 20 acres at the village Kallithea in Farsala at the Karyes area. THE SOIL: The soil composition is sandy-clay, rich in organic substances with a significant percentage of gravels (about 30%)- that results in a very good drainage. MATURATION: 12 months in French and American oak barrels. FEATURES: Bright purple color with complex aromatic profile of red fruits, chocolate and spices. Well structured with soft tannins and spicy aftertaste. Potential long lasting ageing in bottle for 4-7 years. ΑΜΠΕΛΟΤΟΠΙ: Ιδιόκτητος αμπελώνας 220 στρεμμάτων στις πλαγίες του Γερακλίου, σε υψόμετρο 400 μέτρων με κλίση 8% και βορειοδυτικό προσανατολισμό. ΑΜΠΕΛΟΤΟΠΙ: Ιδιόκτητος αμπελώνας 220 στρεμμάτων στις πλαγίες του Γερακλίου, σε υψόμετρο 400 μέτρων με κλίση 8% και βορειοδυτικό προσανατολισμό. Ιδιόκτητος αμπελώνας 20 στρεμμάτων στην Καλλιθέα Φαρσάλων στην περιοχή Καρυές. 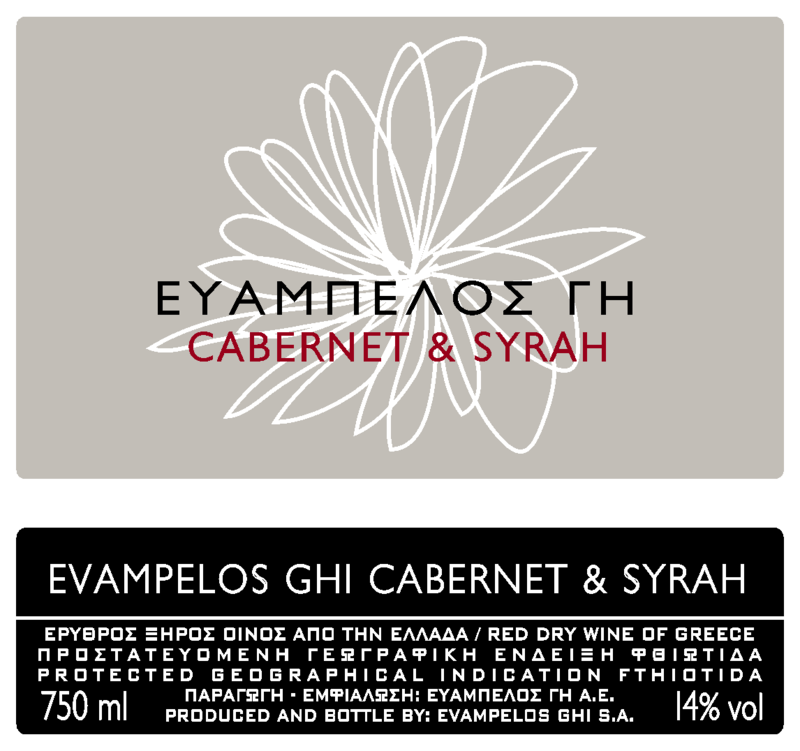 ΠΟΙΚΙΛΙΕΣ: Cabernet Sauvignon 35%, Syrah 30%, Merlot 30% και Λιμνιώνα 5% σε ισόποσες αναλογίες. 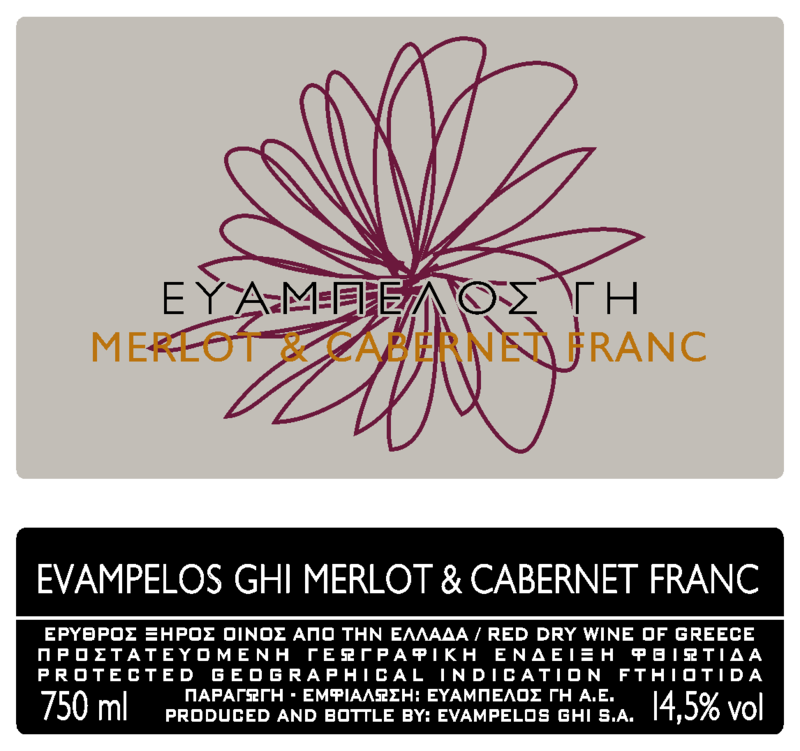 ΧΑΡΑΚΤΗΡΙΣΤΙΚΑ: Το Merlot & Cabernet Franc είναι ένα πλούσιο και πολύπλοκο κρασί, με ενδιαφέροντα αρώματα, όπως τα κόκκινα φρούτα, κεράσια και φράουλες με πιπεράτο χαρακτήρα και με νότες από γλυκά μπαχαρικά, έχοντας παράλληλα καλό σώμα και καλοδομημένες τανίνες, αφήνοντας μακριά επίγευση στο στόμα. Δυνατότητα μακρόχρονης παλαίωσης για 10 με 12 έτη.